Winter is upon us and the roads will eventually be getting icy, slippery and generally dangerous to the inexperienced winter driver. So in preparation for the wintery driving conditions, here are some car help tips for driving in wintery conditions and avoid unnecessary car repair. If you live in an area that gets a good amount of snow (i.e. in rural areas or where the city isn’t the best at plowing that snow), it may be worth it to invest in a couple pairs of snow tires. Snow tires have heavier treads that allow you to keep traction and control while driving in icy or snowy conditions. Stop by your auto shop for more information. When you are on a road or a surface which looks (or feels questionable) it is important to be very gentle with your cars controls. It may be useful to check the traction that your vehicle has, by slowly increasing pressure on the gas until you hear the engine’s RPM’s spike (be careful! And watch your speed!). The spike indicates that your tires are slipping on the surface and let’s you make a mental note of how much traction you have and how much gas you can give the car before slipping. This is a key piece of advice to avoid plunging into a ditch, or spiraling out of control into that guard rail and ending up with a hefty car repair bill at the auto shop. 4-wheel drive vehicles provide better traction when on icy roads, but they do not provide ANY help when stopping. This is crucial to know. ABS systems and good tires can reduce stopping distance in icy or snowy conditions but the 4-wheel drive system itself will have no effect. DO NOT spin the wheels of the car, this will get you dug in deeper and make it more difficult to get out. You may want to turn your wheels back and forth a few times to push snow out of the way. Try rocking the vehicle (gently!). Shift from forward to reverse, and back again. Each time you’re in gear, give a light touch on the gas until the vehicle gets going. When driving in slippery conditions, one of the most important tips is to avoid any sudden movements or accelerations when driving. This is the best way to lose traction and cause the car to slip, slide or fishtail, potentially causing you to lose control and wreck the vehicle. This is possibly the most important winter driving tip in this list, and it should be followed to avoid unnecessary car repair and possible injury as well. 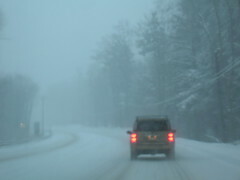 Another important winter driving tip is how to recover from a loss of control. In order to avoid a wreck and expensive repairs at the auto shop, the key is to ease the brakes. Don’t make any sudden or rough braking moves to avoid skidding in the first place. If you do have to suddenly brake and end up in a skid, turn in the direction that the vehicle is skidding and let off the brakes until you feel the car regain control.